November 16, 2016 By This post may contain affiliate links. Surprise your party guests this Thanksgiving by serving these sweet little Chocolate Turkey Cups filled with Pumpkin Cheesecake Mousse. Each mini dessert will surely get gobbled up quickly. The traditional Thanksgiving menu that my family enjoys each year is really nice, but it’s not very festive so I always try to liven things up by making something cute to serve. As soon as I saw the turkeys with their long spindly legs and big plume of feathers I knew I had to recreate some out of chocolate. I just love when something like this quirky holiday decoration inspires me to get into the kitchen. As you can see, the chocolate version is quite different in design, but it’s equally kooky. I started by making a chocolate cup using a small plastic shot glass as a mold. I just had to add the skinny turkey legs and decided to make them out of chocolate too. To make the plume of feathers which wraps around the back of the chocolate cup, I chose to use candy clay because it’s flexible enough to bend but firm enough to hold it’s shape and it tastes like chocolate so it pairs beautifully with the rest of the treat. 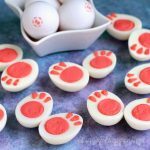 I love using candy clay instead of fondant to decorate my treats Candy clay tastes so much better and looks just as good. Plus it’s super easy to make at home using 2 ingredients. If you are interested in learning more about how to work with candy clay, be sure to check out my new book, Candy Clay Creations. It’s over 100 pages of detailed step-by-step instructions and tutorials for working with candy clay. It’s now available in both printed and e-book formats. Check it out, here. 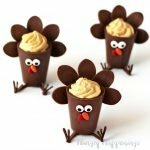 You are going to need to make a batch of candy clay before you make this sweet little chocolate turkeys. Take a look at this video to see how you can make these fun Thanksgiving desserts in your own kitchen. 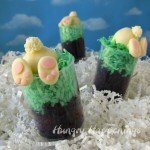 You can make these candy cups using melted and tempered milk chocolate or light cocoa candy melts. If you use the pure chocolate you can simply allow the chocolate cups to sit at room temperature until hardened. If using the candy melts you’ll want to pop them in the freezer for about 5 minutes. If left for too long, they will crack. Make extra legs and feet. You will probably break some as you are working so it’s best to have some extra for Thanksgiving day. If you’d like to see a detailed step-by-step photo tutorial of making the chocolate cups be sure to scroll down to the bottom of the post and click over to see the other chocolate cups I’ve created for you. You’ll need 2 ounce shot glasses that are tapered and are perfectly smooth inside. I found mine at Walmart in the kitchen gadget section. Chocolate cups decorated like turkeys filled with pumpkin cheesecake mousse. Fill a plastic shot glass with chocolate. Set aside for 3-5 minutes (if your chocolate is thin it will take 5 minutes to create a thick enough coating on the glass). Turn shot glass upside down and allow the wet chocolate to drip out (tapping the cup as needed to help the chocolate fall out more quickly). Scrape the chocolate off the opening of the glass. Set the glass open side down on a parchment lined baking sheet. If using pure tempered chocolate you can either leave the chocolate cup at room temperature or refrigerate it for 5-10 minutes until hardened. If using candy melts, freeze the chocolate cup for about 5 minutes until the candy hardens. Once the chocolate hardens, pull the chocolate out of the glass. Use melted chocolate as "glue" to attach two candy eyes and one orange sunflower beak and one red sunflower wattle to your cups. Pipe two 1 1/2 inch long chocolate legs and two feet onto a parchment paper lined baking sheet for each turkey, making several extra sets in case of breakage. Let the chocolate set until hardened. Attach two legs to the base of each chocolate cup using melted chocolate. Attach two feet to the ends of the legs, holding them in place until the stay upright. Roll out candy clay to 1/16th inch thickness. Cut out 5 long tear drop shaped feathers for each turkey. Press the pointed ends of 5 candy clay feathers together forming a fan of feathers. 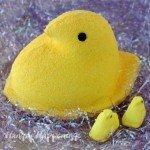 If needed, you can brush a tiny bit of water on the edges of the candy clay feathers to get them to stick to each other. Let the feathers dry for 30 minutes then use melted chocolate to attach the feathers to the upper edge of the back of each chocolate cup. Beat the cream cheese using an electric mixer until light and fluffy. Add powdered sugar and beat until combined. Add the pumpkin, vanilla, and pie spice and beat just until blended. Spoon in the whipped cream and beat until fluffy. Spoon or pipe into the chocolate turkey cups just before serving. 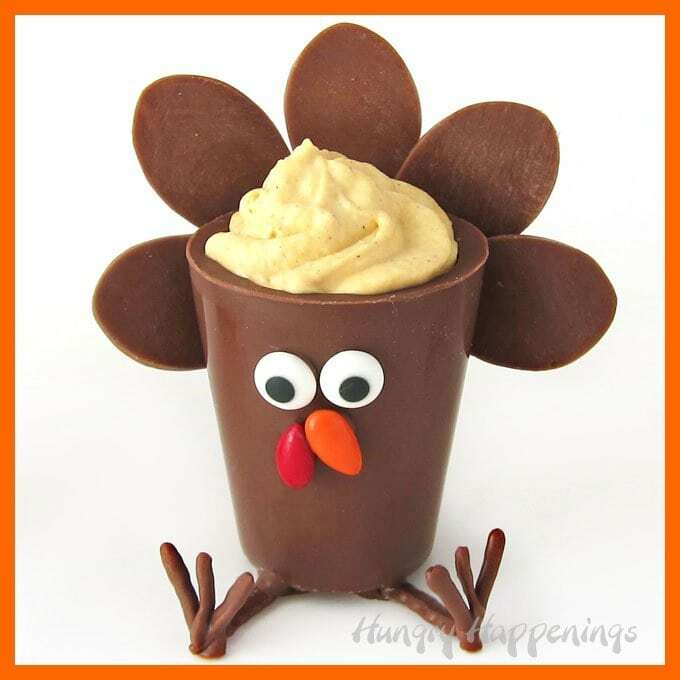 If you have to travel with your chocolate turkey cups, I’d suggest either attaching just the chocolate feet directly to the chocolate cup or bringing chocolate with you to attach the legs and feet at the party. Each of these mini desserts will hold about 1.3 ounces of mousse. If you aren’t a fan of pumpkin, you could fill them with chocolate mousse, white chocolate cherry mousse, dulce de leche mousse, or cookies ‘n cream cheesecake mousse. 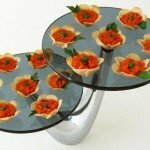 Or you can fill them with ice cream, pudding, or candy. Which filling would you like best? 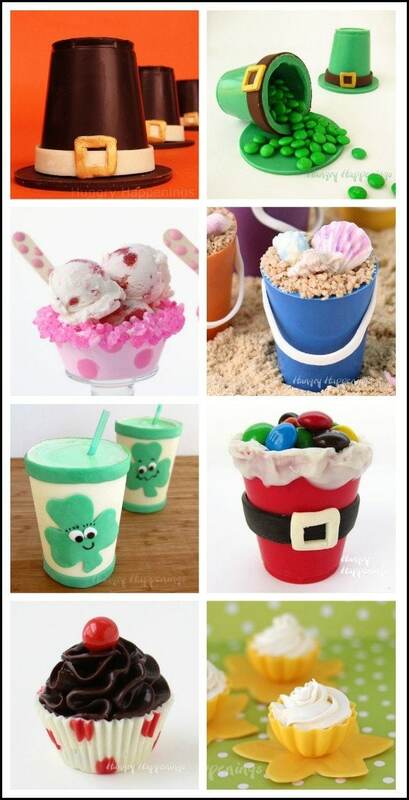 Here are some more ideas for making, decorating, and filling chocolate cups. 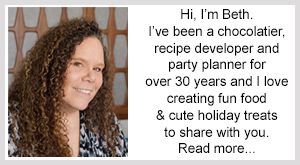 Click the links below to see the recipes and tutorials. Eeeek!! er, gobble, gobble! You could even put sweet potatoes in these adorable little turkeys and I would still eat them!! I’m glad I’m not the only one snapping pictures in stores as inspiration for cute treats. It happens all the time. I found the turkey candle holder and actually was compelled to buy it even though I haven’t hosted a Thanksgiving dinner in many years. It was just too cute to pass up. So it sat next to me while I made the chocolate version giving me inspiration! Those are so stinking cute! Would love for you to stop by and link this up to More The Merrier Monday. 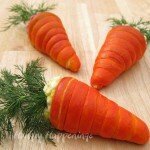 if i make these a few days in advance what is a good way to store them? 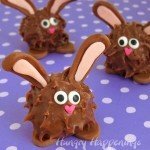 I would make the chocolate cups and store them at room temperature then keep the mousse refrigerated. I like to spoon it into my pastry bags then refrigerate it in the bag. Then just before serving, I quickly pipe the mousse into the chocolate cups and they are ready to go. Have a happy Thanksgiving.